Giden lives quietly by himself on the outskirts of his Amish community and that's the way he likes it. After losing his wife and child he just isn't ready to be social anymore. The grief and the guilt is just so strong he can barely stand it. Then one night while a snowstorm is raging outside he hears a car horn from up the road. He makes his way to a crashed car to find a beautiful Englisher who has crashed her car on the icy road. Avery can't believe any one could live so primitive like Gideon does. As she continues each day to get better she slowly comes to relish the quiet and peacefulness of living in the country. So very different from the wild city life she has been living. She finds herself in the process getting closer to God and wanting to help heal Gideon's broken heart. From the first page of this book I was immediately drawn in to the story again. 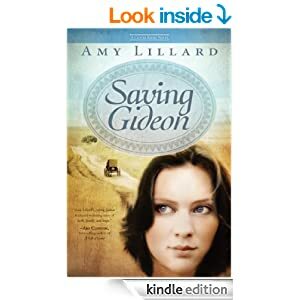 Yes, Amy Lillard has wrote such a compelling Christian romance story that I wanted to read it again! It's been awhile since I have read a book, the second time and couldn't put it down! I laughed and cried once more reading this wonderful romance book. I love how Amy Lillard wrote the book dealing with circumstances that are different, but yet you can identify with them. Such a great book, with passages from the Bible, dealing with faith interwoven throughout. It made me remember the hope and the healing that our loving God can give.